Like The Lovely Bones and The Curious Incident of the Dog in the Night-Time, Cammie McGovern’s breakout novel is at once a hypnotic thriller and an affecting portrait of people as real as our next-door neighbors. In Eye Contact, two children vanish in the woods behind their elementary school. Hours later, nine-year-old Adam is found alive, the sole witness to his playmate’s murder. But because Adam has autism, he is a silent witness. Only his mother, Cara, can help decode his behavior for the police. As the suspense ratchets, Eye Contact becomes a heart-stopping exploration of the bond between a mother and a very special child. Cammie McGovern was a Stegner Fellow at Stanford and received the Nelson Algren Award in short fiction. Her work has been published in Redbook, Seventeen, Glimmer Train, TriQuarterly, and other publications. This is her second novel. Cara is not the only parent in the book who struggles with raising a child with special needs. Morgan's mother, Kevin's mother, and Amelia's mother are all in similar situations. What are the differences between the ways that they treat their children? Do you think that some of the mothers fail where others have succeeded? What do you agree and disagree with in each of their situations? When Adam begins talking to the police and offering them clues, they have a difficult time understanding what he is getting at. For instance, one word he blurts out without prompting is "hair," which confuses Detective Lincoln because, as he says, "the guy we've got downstairs is bald" (p. 157). However, this particular word becomes very significant later on in the investigation. How different would the search for Amelia's murderer have been if Adam had been an average nine-year-old? What kind of obstacles would have been avoided? What new difficulties would the police have faced? On page 25, when she is being interviewed by the police, Amelia's teacher June is forced to admit that though she had planned on pairing Amelia with a partner from another classroom to help her development, she hadn't had the chance to do so. In the aftermath of a tragedy, people surrounding the victims often have feelings of regret, wishing they had done something differently that might have prevented what happened. Have you ever been through a situation like this one? How did you cope with your feelings of guilt and regret? How does June cope with hers? Are there other characters who feel similarly about Amelia's murder? Cara and Suzette's friendship is a continuing subplot throughout Eye Contact, and there are moments when it seems like they are the best of friends and other times when they are very distant from each other. Many of their misunderstandings revolve around Kevin and the feelings each of them has for him. What reasons do you think that each of them has for caring about Kevin? Do you think their friendship might have lasted if they had confronted Kevin when they were younger? What does the title "Eye Contact" mean to you? It is mentioned a couple of times in the book in reference to Adam—one of the most important things one can do to get an autistic child's attention is to gain eye contact—but it also serves as a larger metaphor for many of the characters and their relationships in the novel. How do you think the term applies to Teddy and June, for instance? Or Kevin and his mother? When Morgan's mother takes him to the police after he's admitted to starting the fire, she says to him at one point, "You're fine, Morgan, my God. A lot of people don't have friends. I never had any friends" (p. 159). Many of the other characters in Eye Contact are similarly isolated from their peers. What does this say about the way that both children and adults in their neighborhood communicate with one another? What do you think about Morgan's mother's comment—is it "fine" not to have any friends? When Morgan embarks on his own search for Amelia's killer, he forms an unexpected alliance with Fiona, another misfit student at the middle school. She tells Morgan, "the day after the murder Chris sat in front of me and started saying all this stuff about how he hopes people realize how bad it can get, that people can die from bullying" (p. 209). To what extent do you think Chris was right about this? Discuss some of the terrible things children do to one another in Eye Contact and whether you've observed this kind of behavior in young children you know. What are some of the ways this kind of cruelty can be prevented? One of the results of Adam's autism is his appreciation for classical music and his love of opera. He has perfect pitch and impeccable hearing ability. Why do you think that a child who has such a difficult time with language and communication loves music so much? What are his musical talents compensating for? How might they be able to enrich his future life? Amelia's mother fought to have her daughter placed in a special education classroom while Cara has been fighting since Adam was young to have him integrated into a normal classroom, with the help of an aide. How do you think their respective learning environments affected Adam and Amelia? In what ways might it have had an impact on the burgeoning friendship between the two children before Amelia died? When Cara is thinking back over her relationship with Kevin, she admits to herself that "he's kept certain secrets for reasons she can't understand . . . [but] so has she. If an impartial outsider looked at their lives, weighed the sins of omission, it's likely that Cara would be found at far graver fault" (p. 210). What does the author mean by this? Do you agree with this statement? What are the sins of omission that Cara has committed, against Kevin, against her parents, against Suzette, against herself? 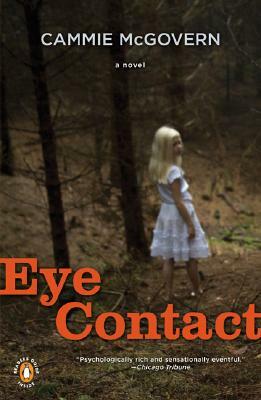 Although Adam is not a first-person narrator in Eye Contact, there are numerous sections that are written from his point of view. What did you learn about autistic children and how they see the world after reading this book? What preconceptions you have about childhood and communication are challenged by Adam's story? Morgan is convinced that if he finds out who killed Amelia, he will be forgiven for the crime he committed. Many of the characters in Eye Contact are in search of a similar kind of redemption. Do you think any of them are capable of achieving it? In light of this theme of redemption, how do you feel about where the different characters end up at the book's conclusion?